- To demonstrate that we set up a system which was favourable for protein expression. - That we were able to design and express our own open-source single chain insulin, Winsulin, along with human proinsulin that will be correctly folded. - That we could target expression to the cytoplasm, periplasm, as well as the extracellular medium (secreted) and that we could easily purify these. - That our insulins will be biologically functional when tested with glucose uptake assays. BL21 E. coli and SHUFFLE E. coli are well-characterised commercial strains of E. coli. These were used to express insulin in the periplasm and cytoplasm respectively. The WB800 strain of Bacillus subtilis was used for insulin secretion. This strain is a non-commercial strain, and it was donated to us from Professor Sui-Lam Wong’s laboratory at the University of Calgary, Canada. This strain was appealing to use in our project due as 8 proteases had been knocked out of the genome, eliminating the chance that these proteases could degrade insulin within B. subtilis. 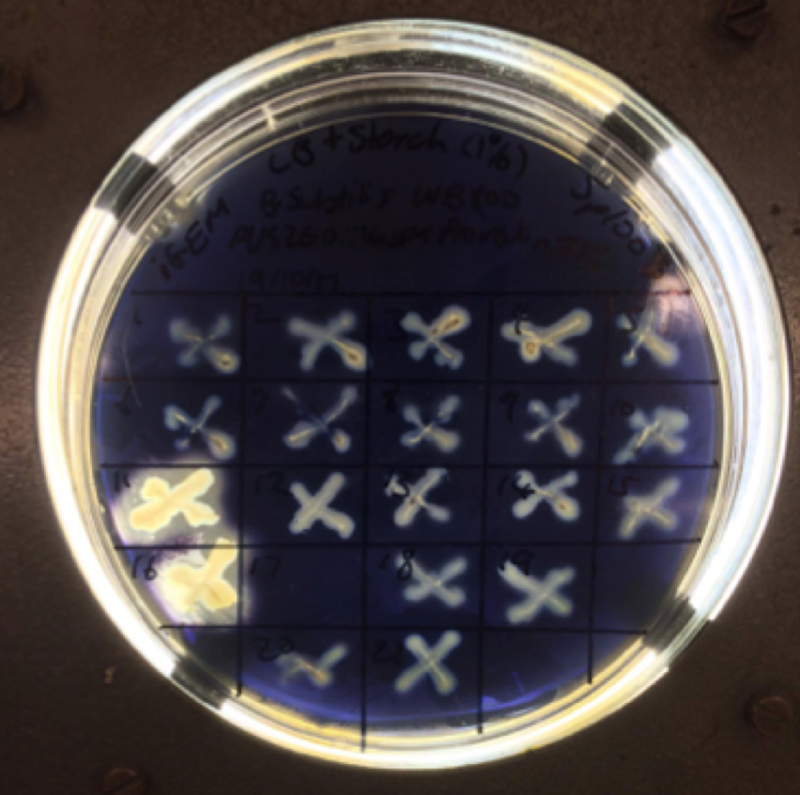 In order to demonstrate that these 8 proteases were knocked out, we plated this strain alongside wild-type B. subtilis 168 on an LB+milk plate. In the wild-type B. subtilis 168 strain, these proteases proteolysed the milk on the plate, forming a clear area around the colonies. If the WB800 strain was in fact a protease knockout, no proteolysis would be expected and either a minimal or no clear zone would be detected. Our results showed no signs of clearing resulting from protease activity in the WB800 strains, demonstrating that this strain was in fact deficient in proteases compared to the WT168 strain. This property made it ideal for protein expression. 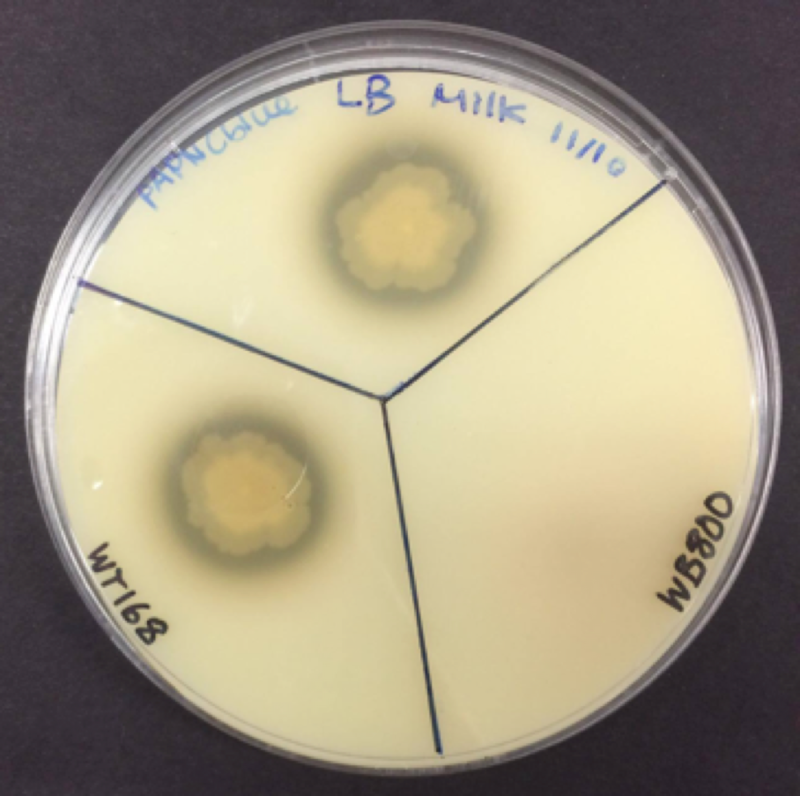 Figure 1: Wild type (WT) B.subtilis 168 and WB800 B.subtilis grown on an LB milk plate. Our E.coli expression vector, pET15b, is a well-known and characterised system for inducible expression that has been demonstrated to work. The expression vector we chose for expressing insulin in our Bacillus secretion system, pUS258, was constructed in our lab by a PhD student. This vector is an E.coli/Bacillus SHUFFLE vector that is also integrative in the B. subtilis genome. Integration of the gene (i.e. in our case, an insulin construct) inserted into pET15b into the B. subtilis genome results in the knockout of 2 amylase genes, AmyE. It was important that our integrative vector did not integrate into a protease gene that was knocked out in our WB800 strain – had it done so, integration would not have been successful. In order to demonstrate that this vector was in fact integrative and did knockout these two genes, our transformants were plated onto LB+starch plates. If integration was successful, the amylase genes would be knocked out and thus no amylase would be produced to break down starch. When flooded with iodine, the LB+starch plate would not show any clearing of starch around the colonies. Our results showed that many colonies did not break down starch, and starch break down occurred in only a few colonies. This demonstrated that the pUS258 vector was in fact integrative and functional. Hence, we were able to effectively demonstrate that our expression systems, particular our B. subtilis expression system which was not well characterised, were both functional and favourable for protein expression. Figure 2: pUS258::YncM insulin transformed into B.subtilis WB800 patched on LB Agar + 1% starch + Spectinomycin 100. The next step was to demonstrate that our insulins were expressed following IPTG induction. In an ELISA assay, we tested for the presence of insulin in whole cell lysate from E. coli expressing cytoplasmic and Ecotin insulin, whole cell lysate from B. subtilis expressing YncM insulin, as well as the presence of insulin secreted by B. subtilis in His-tag purified media. Prior to the ELISA assay, all lysates and media were treated with proteases to remove expression tags, His-tags, and in the case of proinsulin the C-peptide was removed to form active insulin. Figure 4: ELISA confirms expression of constructs, and the correct folding of Insulin and Winsulin constructs. Cytoplasmic proinsulin and Cytoplasmic Winsulin were found in E. coli whole cell lysate, demonstrating that induction of E. coli to produce insulin in the cytoplasm was successful. Ecotin proinsulin was also detected in whole cell lysate of E. coli cells. Whole cell lysate was used for this assay rather than the periplasmic fraction, as SDS-PAGE could not determine that insulin had been induced in the periplasmic fraction. As a result, we were unable to test whether the Ecotin tag had directed insulin expression to the periplasm. YncM Winsulin was detected in the His-tag purified B. subtilis medium. The presence of YncM-tagged insulin in purified media demonstrates that our YncM tag did successfully target proteins for section, and that our purification step retained at least some Winsulin. Since antibodies have a high binding specificity, the binding of our insulins to anti-insulin antibodies is a strong indication that our insulins were folded correctly and thus have a very high structural similarity to native insulin. Positive ELISA results for both Cytoplasmic Winsulin and YncM Winsulin were particularly exciting, as they demonstrate that our novel, previously untested Winsulins are able to bind to anti-insulin antibodies and are thus highly structurally similar to native insulin. Figure 5: Expressed recombinant insulins stimulate glycogen synthesis. 4A and 4B: Comparison of mean glycogen synthesis rate in a glucose uptake assay using human HepG2 (4A) and murine AML12 cell lines (4B). 4C: Comparison of mean rate of glucose oxidation in HepG2 cell culture from glucose uptake assay. 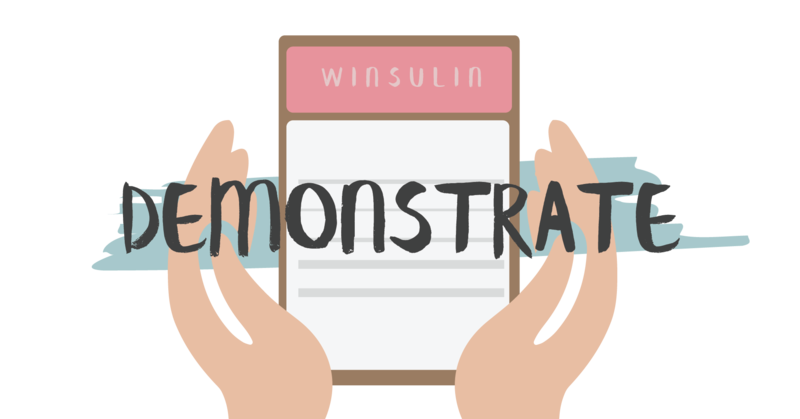 Conditions indicated on the graphs are: Basal (no insulin added); Ecotin Proinsulin (from whole cell lysate with trypsin treatment); Cytoplasmic Proinsulin (from whole cell lysate with trypsin treatment); YncM Winsulin (cell culture media only). Refer to protocols page for experimental details. 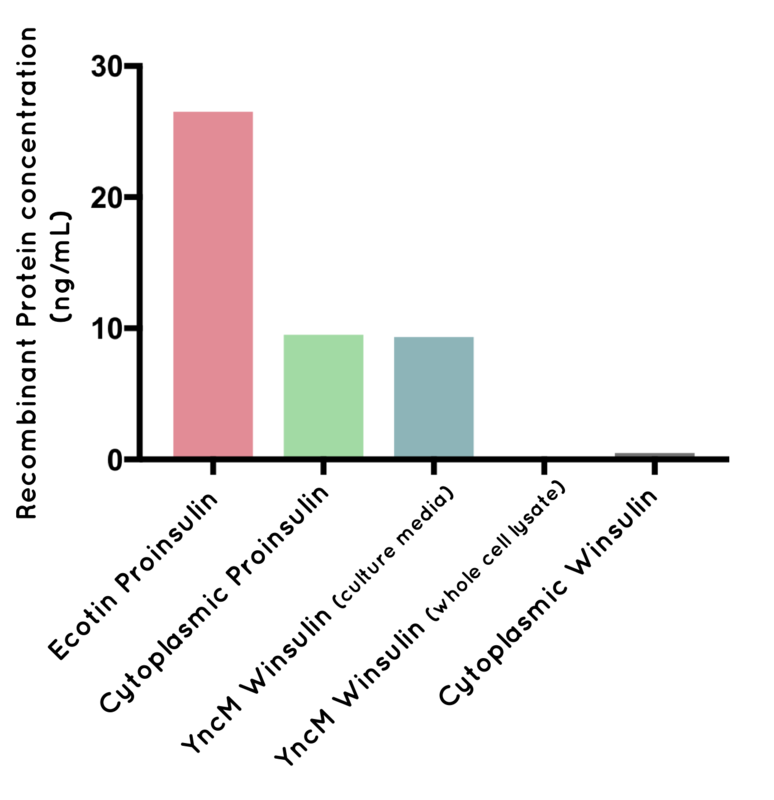 Error bars represent SEM, horizontal bars indicate statistical significance (* = p<0.05, ** = p<0.0001) calculated with GraphPad Prism using unpaired 1-tailed T-test, n=3. To validate physiological activity of Cytoplasmic proinsulin, Ecotin proinsulin, and secreted YncM Winsulin which were detected in the highest concentrations in the ELISA, we performed glucose uptake assays using both mouse and human adipocyte cell lines. Measurement of the rate of glycogen synthesis as part of this assay found that cells treated with Ecotin and Cytoplasmic proinsulin had significantly higher activity than cells at the basal level. The results of this assay also gave a strong indication that secreted YncM Winsulin is biologically functional, however the results for YncM Winsulin were not considered statistically significant and hence could not be definitively proven. 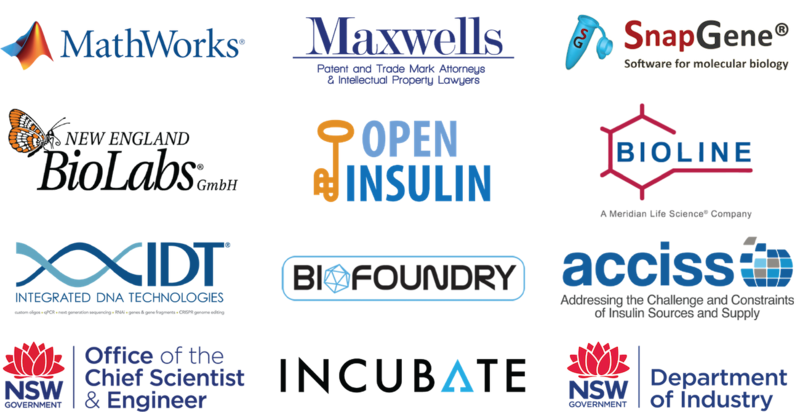 This could be due to the fact that we did not have sufficient insulin remaining from the His-tag purified B. subtilis media to perform the assay at the recommended concentration of 10nM insulin. It is possible that insulin was lost during the His-tag purification step, or that only small amounts of insulin were secreted by B. subtilis in the first place. Both of these possibilities will be tested further. A more in depth evaluation of our future direction can be found on the results page. Overall, we believe that this project was a success!